So, I went and watched World War Z. And it was okay. I mean, it was suspenseful and made my heart race and everything. But it was nowhere near the awe-inspiring experience that the book was. So I went home and reread the book. And I have to say, the book was not as good the second time. The problem with almost all fictional world-spanning books tends to be the very simplistic geopolitics. Like, oh, your fictional Russia becomes dogmatic and authoritarian? And your fictional Brazil has illegal organ transplantation? It’s not an attractive trait in a book. Orson Scott Card is as guilty of this as anyone. Oh god, his Ender’s Shadow books are so cringeworthy. Like, is this really how he sees the world? World War Z is saved by its sheer fertility. There’s always another story. There’s another voice. The personal outweighs the political. And there are some surprises. I liked the snippets of India in the book. And the Cuban and North Korean stories were interesting. Max Brooks obviously based World War Z on Studs Terkel’s oral histories. 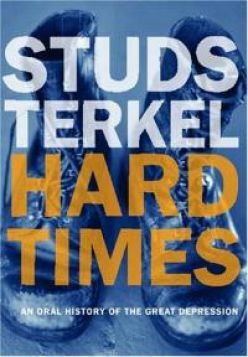 And I actually have one of those, his history of the Great Depression–Hard Times–that I’ve been meaning to read for ages, ever since my mind was blown by Studs Terkel’s monolithic book Working (where he interviewed people about our jobs). Hard Times isn’t quite as good as working, mostly because there’s a certain monotony to people’s experiences of the Depression. Yes, they were poor. Yes, they felt a bit angry at the system. Or no, they actually did well in the Depression and didn’t notice it at all. It doesn’t have quite the same playfulness as Working. But it’s still excellent. At times, Terkel comes close to one of my big pet peeves as a writer. I really hate it when writer introduce a non-white character without explicitly mentioning their race or color and then expect you to intuit their ethnicity. In practice, this is mostly a problem with black characters (since Asian, African, and Hispanic characters tend to be given away by their names). Weirdly, every white person I mention this to doesn’t really feel this way. They’re like, “Oh well, maybe if their race is relevant to the story.” No. If the character is black, just say he or she is black. It’s really that simple. The “intuit the character’s race” method leads to one of two problems: a) stereotyping; or b) whitewashing. If you require the reader to intuit a character’s race, then you need to give that character traits that are associated with that race: a dialect; certain habits; media choices; neighborhoods, etc. And that’s fine, if that’s who you’re writing about. But what it means is that the only black characters in your work will tend to be ones who embody stereotypes. This is because audiences tend to read characters as white, unless they’re unable to. So if you have Levi Jones, the Harvard-educated lawyer, it doesn’t matter if you think of him as a black character, readers are almost always going to read him as white. Usually, in fact, they’ll even ignore whatever “clues” you sprinkle through the text (which is why, for instance, most white readers read the characters in Earthsea as being white). If you want the audience to see a nonstereotypical character as being of a certain ethnicity, then you need to hammer it home, so it cannot be ignored. This is, in some cases, obviously a result of Studs Terkel asking race-oriented questions, which makes it seem super disingenuous to pretend, in the intros, like he somehow doesn’t see the race of his respondents. But whatever, at least it’s not confusing, which is what I care about. I agree, but I am curious what you think about characters left ambiguous on purpose. Not hidden, hinted at, or danced around to avoid stereotypes, but left unaddressed specifically to leave casting up to the reader. I’m thinking of character/personality types that could go any way, racially, for example (hesitant to use this example) Nick Fury. I’ve been reading through the Crowded Magazine slush, and a lot of stories don’t give you much sense of who the characters are in relation to the society they live in – there are no indicators of race, age, or economic status; some of the first-person stories don’t even give you gender cues. When WWZ’s Redeker Plan of sacrificing huge numbers of people to ensure safety for others is enacted, we get Nelson Mandela giving the order himself. After setting out the blunt practicality of the plan and arguing that terrible things must be done in order for anyone to survive, Mandela shows up to, as I see it, provide moral absolution. It’s not enough to show that That’s What You Gotta Etc. ; we need to be reassured that it’s okay. And it’s okay because an authority figure says it’s okay. And not just any authority figure, but a secular saint whose moral standing is rooted in racial politics. Mandela in WWZ isn’t described in terms of his accomplishments – but his race is brought up repeatedly: his Xhosa middle name is given, he greets Redeker in Xhosa; “He embraced the white Afrikaner.” I can’t help suspecting that the whole reason Brooks set something like the Redeker Plan in South Africa was to set up this scene, that the payoff is having the saintly black man assure the white man that what he did was the only way, and there’s nothing to forgive. Yes, I think that when you are confronted with the option of mentioning a characters’ race or not, it brings a lot of things into stark contrast. You’re forced to think, “Oh, are there actually any black characters in my book?” And you’re also forced to think, “Do I only think of this character as being black because that is the stereotype?” It feels easier to just cut through it by not mentioning race, although I think that Brooks actually usually does work in peoples’ race. Ugh, what I hate is when people don’t mention someone’s race and then later claim that the character was black. Like Neil Gaiman recently claimed that Shadow, in American Gods, is a black person. Uhh, come on dude. I’ve read the book twice, and it is definitely not nearly so clear cut. He’s kind of dark-skinned, but not at all in a way that’s definitely African-American. I think that somewhere toward the end of American Gods, we’re told that Shadow’s mother is black. Now, I’ve been to a lot of the same roadside Americana that turns up in the book, and I got a lot of suspicious staring when I’d stop in some tiny town to ask for directions. And I look and sound like a pretty unremarkable white Midwesterner. I can’t imagine a mixed-race man getting any more hospitality than I did. And before Shadow’s arrested, he lives in a small town, and his wife’s a white woman – but we never see anyone reacting to this. It just doesn’t square for me with what I’ve heard about black families breathing a sigh of relief when they crossed the Canadian border on vacation, or my former boss – a black retired Marine – telling me how when he was new to the state he’d said he was thinking of checking out some particular outlet stores, and was warned that that particular small town wasn’t a safe place for black people. I mean, I don’t think that every interaction in a real-world Shadow’s life would be that unpleasant. But I don’t remember any scenes where rural and small-town white people treat him differently than they would a white guy. And that didn’t ring true to me. In Brooks, though, every step of the story is shaped by the larger social forces, and he even takes time to specifically mock the fantasy of “come the apocalypse, I’ll just hole up with my guns” that drives so many zombie stories. Yep! I think that WWZ is a great novel; the first time I read it I was completely blown away. It took a second read-through to even begin to see some of its flaws.